Will our country follow, despite an admirable Constitution and vibrant civil society, the path of neighbouring Zimbabwe, where a predatory state enriches the elite while investors flee, unemployment rises and government institutions collapse? By JEFFREY HERBST and GREG MILLS. On 31 March, President Jacob Zuma fired respected finance minister Pravin Gordhan, his deputy Mcebisi Jonas and seven other cabinet members. In so doing, he emptied his Cabinet of his critics. Gordhan was widely perceived as the final bulwark against Zuma’s intention to turn the state into a large patronage machine to benefit the president’s allies. The reshuffle also set the table for his ex-wife Nkosazana Dlamini-Zuma to be elected when the nation must go to the polls in 2019. 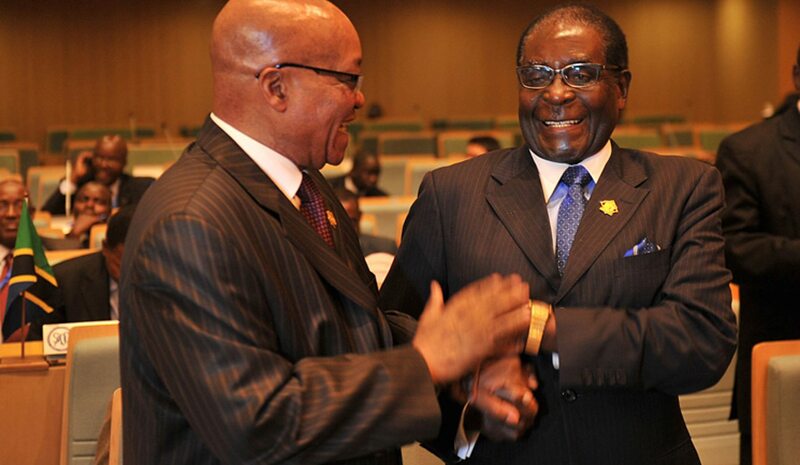 South Africa has reached its Mugabe moment. Will it follow, despite an admirable constitution and vibrant civil society, the path of neighbouring Zimbabwe, where a predatory state enriches the elite while investors flee, unemployment rises and government institutions collapse?Reaction by the President’s immediate colleagues was swift, negative and not particularly effective. Deputy President Cyril Ramaphosa, who is widely respected among the country’s business leaders and those abroad but has been useless to date in opposing Zuma’s actions, criticised Zuma’s actions as “totally, totally unacceptable” but said that he would not resign. The ANC’s secretary-general, Gwede Mantashe, similarly said that he was “uncomfortable” with Zuma’s actions but gave no hint of moving from his post. Now that Zuma has placed collaborators in all key cabinet spots, we know the country’s path if he stays in power and is followed by his ex-wife. The state-owned enterprises, especially the rails, ports and airways, will continue to be squeezed to provide patronage to the “tenderpreneurs” that form an important Zuma constituency. South Africa will undoubtedly move ahead with a deal for a large number of Russian nuclear plants that are not only inappropriate for the nation’s needs but will provide extraordinary opportunities for graft. Property rights for farmers and mines will be further diminished so that Zuma allies can participate in once-thriving South African industries that are now in decline because of a lack of business confidence. Foreign investors will look elsewhere, and South Africans will move their money out. In this scenario, South Africa’s official unemployment rate of more than 27% (36% of those too discouraged to look for work are counted) will continue to rise. The nation’s debt will be downgraded (rating agencies S&P and Fitch have since downgraded the country to junk status), and it will enter a spiral where ever-more state funds must be used to service debt and thereby squeeze social services that especially benefit the poor among the African population. The economic foundations of a beautiful land will continue to rot, impoverishing the growing African youth population, among whom already half are unemployed. Why would Zuma be allowed to drive the country into the ground especially as Africans who are the heart of the ANC’s constituency will be hurt the most if the economy shrinks? South Africa is blessed with extraordinarily talented individuals, and the cost of Zuma’s policies is hardly a secret. Indeed, his corruption and incompetence are acknowledged even among his allies. However, in racially divided countries, arguments for good governance are immediately perceived through the white/black optic. Due to the inheritance of apartheid, whites still benefit greatly from their role in the private sector. Because the necessary reforms that South Africa must undertake can always be cast as pro-private-sector and therefore pro-white, Zuma can claim, as he did when firing Gordhan, that he is somehow promoting “transformation.” Robert Mugabe has been allowed to destroy Zimbabwe through similarly clever use of the race card, when combined with bribery and state-instituted violence. He has remained in power despite Zimbabwe’s economy shrinking by more than a third during the past 20 years and average life expectancy falling from 60 to 50 years in the 30 years after independence in 1980. Zuma knows casting reform as caving to the former oppressors while employing patronage to buy off likely opponents and using the state apparatus to threaten can work. It has been no surprise that rhetoric around the necessity to defeat “white minority capitalism” has grown in recent months as Zuma prepared his night of the long knives. South Africa desperately needs to follow a different path that promotes growth so that there are job opportunities for the many youths who are at risk of complete marginalisation. The necessary reforms can be contemplated only if Zuma is removed and a new president comes to power with a determination to end the patronage state and promote growth.